Beginning with the drawn-in composition from the last post, it's now time to get out the paint. It is all too human to hear the siren call of little tiny detail – and much trickier to remember to see the big picture (see my posts on Seeing the Big Picture - I, II, and III). Resist the call! Blocking in the big shapes of the painting will establish your composition, give you a sense about values, and get the white canvas covered. Getting the canvas covered is more important than you may think. 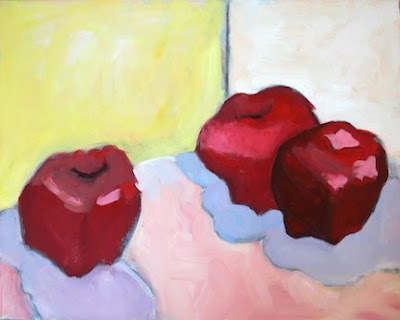 If you focus on establishing detail in one or two areas of the painting, and ignore the white of the canvas in other places, that white will become more and more important, and you may feel more hesitant about what to put there. As you wait longer and longer to get something down, it gets harder and harder to decide. Skip the frustration by putting something down right away! The process of painting is like a conversation. 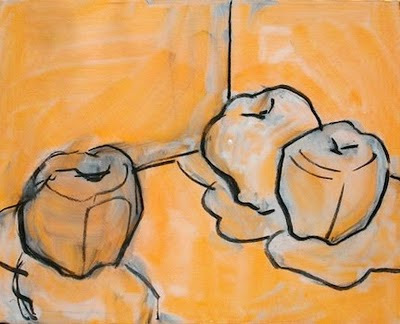 At the beginning of the conversation, you will be doing most of the talking (painting). But remember to pause and listen... the painting will have things to tell you – things you won't know unless you stop, back up, look, and listen. Turn it upside down! Let it talk to you. Sometimes you'll need to wait. Don't charge back into the painting until you know where the painting wants to take you next. When in doubt, keep listening. 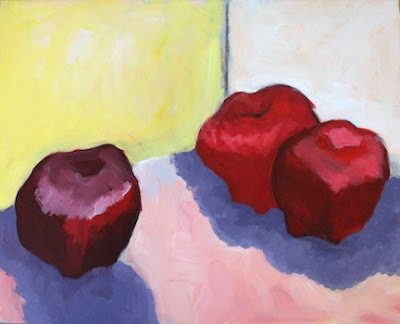 Here, I'm pushing the values darker – these apples needed a little more solidity. The darks won't stay that dark – but I need these darks underneath, to make everything work the way I want it to. Remember, this is a process – don't expect the middle of the process to look anything like the end. The middle of the process is like green goo – it can get pretty ugly. Don't judge it! Just hang in there, and keep going on to the next step. 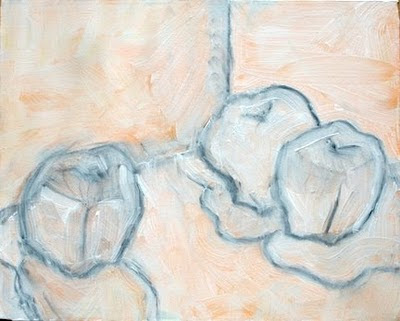 Here's a new way of starting a painting with an acrylic drawing. 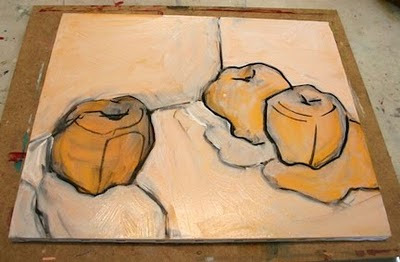 Above, I've begun with a simple still life arrangement. I've underpainted the canvas in a mid-value color (in this case, Cadmium Yellow Deep). Since these photographs are of a second demonstration over the top of the first, you can see something of the first demonstration underneath. This method uses vine charcoal, a drawing medium that can be easily erased - but that also can be absorbed into and darken the paints, when you paint over your initial composition. How can you prevent the charcoal from getting into the paint? Some people draw their composition, and then erase it, leaving a ghost of the drawing to guide them. Here's another method that allows you to draw in charcoal, leave the lines, and keep the charcoal from getting into your acrylic paint. Draw your composition in, using Vine Charcoal (not compressed charcoal). Vine charcoal is easily erased with the edge of a paper towel as you make alterations to your composition. Look at the composition upside down, to make sure it works. Do you see shadows of the alterations I'd made on the first demonstration, underneath this? 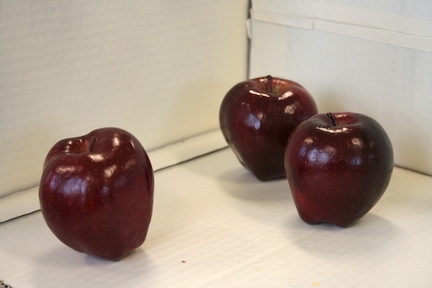 In this second demonstration, without the arrangement above in front of me, I also altered it by leaning two of the apples in towards each other, a change that I think creates a more interesting dynamic. 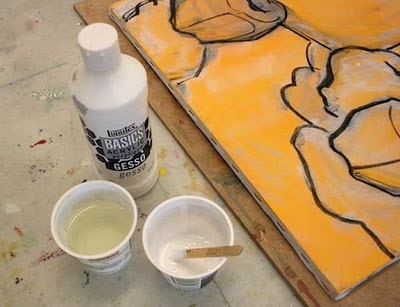 For the next step, mix gesso (primer for canvases, pronounced jess´-oh) and water in about 50/50 proportions. I prefer to use a pourable gesso rather than a thicker gesso for this. For my demonstration here I've used Liquitex's student grade gesso. Make sure the new gesso solution is not too thin and runny (the results then would be like what you see above, from my first demonstration. The wateriness of my solution allowed the charcoal to run more than you'll want). Next, you will apply the gesso solution to the canvas, allowing it to fix the charcoal drawing (make it permanent, so it can be painted over). The best way to do this is to brush the solution inside and up to the lines, not brushing it across the lines, which will smear the charcoal into the gesso solution. Finally, once each area is covered, go back over the entire canvas, painting the gesso solution over any parts of the lines you haven't covered yet. Allow it to dry, and then you can move to the next step, blocking in your colors. 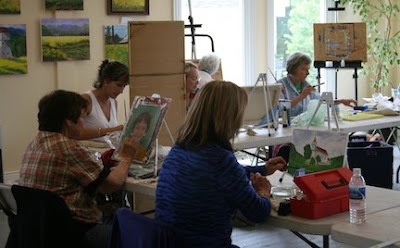 The first four-week session runs from January 12th through the beginning of February. Then the Art Center moves to its new location, in the Cropp Building, at the Napa Valley Fairgrounds, 1435 North Oak Street, Calistoga. We'll have 3,000 square feet of space! With skylights, concrete floors, and a big parking lot! It's going to be a wonderful space for us – I hope you'll join us! 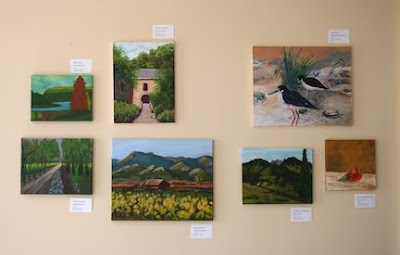 You can find more information online at www.calistogaartcenter.org. 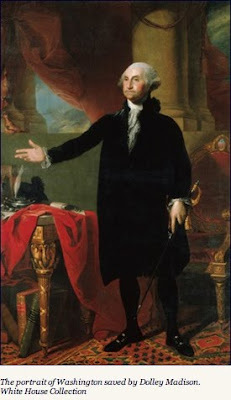 Painter Gilbert Stuart is most famously known for his portrait of George Washington – in particular, the one Dolly Madison saved during the War of 1812, when the capitol was under attack, and the British burned the White House and Capitol building. At the time, painters, sometimes with the help of their assistants, often made copies of their most celebrated paintings. It was a good living - Stuart painted one hundred thirty copies of his most popular portrait of Washington, and twelve versions of the White House portrait. California's life-sized painting of George Washington was painted by Jane Stuart, Gilbert's daughter. 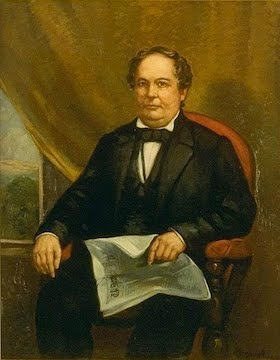 Originally the painting hung in the courthouse in Sacramento, where it was saved from fire by then–Governor John Bigler (governor from 1852 — 1856). Saving the painting was no small feat. Since it was over 7 1/2 feet high and 5 feet wide, with an even larger, heavy wooden frame, he had to talk not one or two, but several men, into entering the burning building — enough men to carry it back out. In gratitude for his heroism (and, evidently, persuasive ability), the legislature named a lake after him. Time passed.... The Civil War broke out. 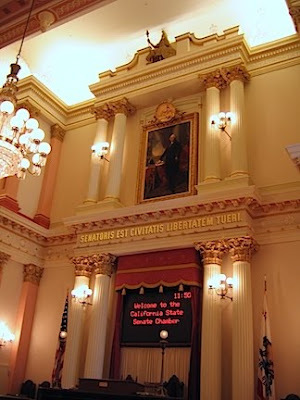 As a state, California sided with the north. But by–now–former Governor Bigler was a Confederate sympathizer. 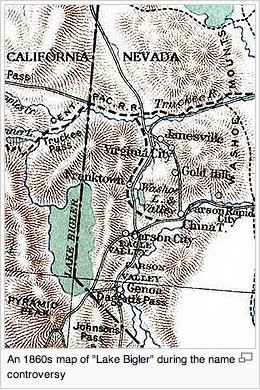 Supporters of the Union protested the honor, demanding that the lake's name be changed, and mapmaker William Henry Knight asked the Land Office in Washington to change the name on official maps. Controversy followed - even Mark Twain complained about the new name, and the state legislature reaffirmed the name of Lake Bigler in 1870. But the new name persisted, and finally in 1945 the California State Legislature officially renamed the lake – which is why today we call the largest alpine lake in North America Lake Tahoe (not Lake Bigler). And Jane Stuart's portrait of George Washington — the oldest painting in the Capitol collection — overlooks the Senate Chamber to this day.